B&W P3 review | What Hi-Fi? B&W’s first foray into the land of on-ear headphones was pretty successful. The B&W P5s (£250) were a stylish, comfortable option and a fine alternative to the Monster Beats by Dr Dre of this world. 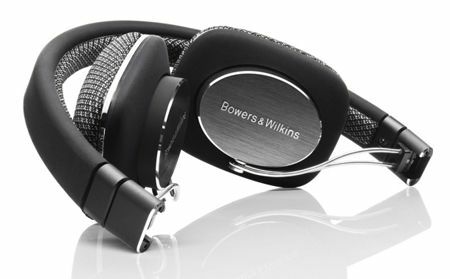 The brand new Bowers & Wilkins P3s are an evolution of this design and although cheaper, they’re more advanced than their predecessor. For starters, they use a completely new drive unit custom-built from the ground up (see diagram below). It features a specially damped diaphragm, using technology derived from the company’s loudspeaker designs, and a new venting system. The aim? To achieve uniform airflow around the driver, lower distortion, and promote a cleaner, more natural sound. They’re notably smaller, lighter and more portable than the P5s. The hinged design means you can fold them up and hide them away in your man/handbag. Alternatively, if you want to protect them from bumps and bruises, you can store them in the chunky clamshell case, which they come in. The earpads are magnetic, so you can simply peel them off if you need to replace them. Of greater note is that they’re covered with a special, co-developed acoustic fabric – B&W has worked closely with the same people who supply the cloth for its speaker grilles. Underneath each earpad, you’ll see B&W’s custom-made driver and a 2.5mm socket, complete with a channel for running the headphone cable through. This makes the cable ultra-secure and also means that it’s easy to remove and replace the whole cable if ever the need arises. And it might: you get two in the box, one ‘regular’ and one for iPhone with an inline mic and controls. This works well, with voices delivered and received loud and clear, while the controller changes track and volume pretty much instantly. We also tried using the inline remote on an Android phone, an HTC Desire to be precise, and while a single pinch played and paused tracks, the volume controls didn’t work and though a double-pinch does skip tracks, it also results in the phone trying to dial the last incoming/outgoing number. So if you’re an Android user, you should swap to the other packaged cable, which has no control or call-answering functionality. The earpieces caress rather than clamp your ears. Each pad uses memory foam so they can mould to the shape of your ears over time – a great excuse not to lend them to anyone, then. It might take a little time to get used to the smoothness of the earpads. Bob your head too energetically and they can slide forward off your ears. Positioning them a little further back gives them a bit more purchase. The headband sits comfortably on your head and a strip of padding makes sure it doesn’t dig in. But enough of design and ergonomics – how do the P3s sound? Low frequencies have a remarkable sense of not only weight but depth too. The P3s display a good sense of control, and they're a refined, easygoing listen that make even low bit-rate files listenable. The shifts in depth and weight to the bassline from Michael Jackson’s Billie Jean are clear, rhythm-driven and solid. There’s plenty of space afforded to music too. As a result, vocals sound emotive, expressive and there’s a fine sense of richness, refinement too. However, since we first tested them last year a new rival has arrived on the block, the Philips Fidelio M1. Put simply, the Philips cans sound even better, which is why we made them our Best portable on-ears £100-£200 in our Awards 2012. In a direct comparison, the Philips M1s deliver even more detail, while the B&W P3s' warm and inviting sound smoothes out all manner of MP3 ills, but loses a level of detail in the process. The P3s are a closed-back design, so noise leakage is kept to a minimum; your fellow passengers shouldn’t be too miffed should you decide crank the volume up to 11. They do a decent job of isolating the wearer from outside noise, but don’t expect the noise-cancelling prowess of the likes of the Bose QuietComfort 15s. So, the P3s are practical, musical and super-stylish. But with the arrival of newer, even more talented rivals – and at a slightly lower price – we've docked the P3s a star.